Winter has finally come to an end, but it’s presence is still very much visible on sidewalks and walls across Vancouver. Pressure washing can help make it better outside by removing any grimey moss and algae build up as well as the remains of rotting leaves, leaf stains, gum, and garbage – all of which can be very off-putting to customers. But in Vancouver the real problem is algae, the stuff that grows on everything. This is where professionals can really help. For years, we have been cleaning sidewalks across Vancouver for some of the city’s best known restaurants and shops. 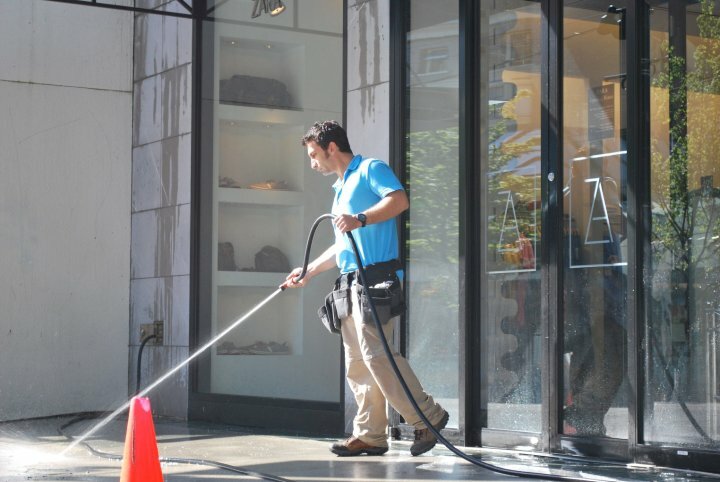 You may well have seen our pressure washing teams and vans working Downtown, on the likes of Robson Street, Alberni Street, as well as on South Granville, and West 4th Ave. The appearance of the sidewalk outside of your business is not something many people think to check but once you see the difference a quick pressure washing visit makes, you’ll never overlook dirty sidewalks again. You can easily clean off some of the airborne dust that builds up on the exterior of your walls after winter with a simple hose rinse and maybe a light brushing. This is is a simple solution for small painted, or vinyl siding walls. For larger walls, or brick walls, pressure washing is a more efficient solution. Our team know the correct power and equipment needed to give walls a new lease of life. For busy business owners, our team can discreetly and quickly get the work done outside of your core business hours, causing little to no disruption to your customers. If your business has a patio, it’s best to get it gleaming before the summer sunshine gets Vancouver residents flocking to you. Patio pressure washing makes a huge impact on small or shaded spaces that don’t receive a large amount of natural light. Much like how clean windows can brighten a room, clean floors can brighten an outdoor area. Our pressure washing services are available to both business owners and residential property owners. So, if you’re considering treating your business’ patio to a pressure washing appointment, why not do the same for your home patio and driveway too? To schedule in a pressure washing appointment at your home or business, call us at (888) 835-0008 or send our pressure washing team a message and they’ll be in touch shortly to arrange an appointment. We began our relationship with IMAGINE Maintenance in 2013 when we started piecing out the more complex components of our maintenance projects to outside companies. We soon recognized the value in their service and their ability to adapt to our clients’ strict security, record keeping, and trades policies. They have had challenging logistics to work with and deadlines to meet and have proven to be more than capable. They conduct themselves professionally and with an emphasis on safety, which is of utmost concern for our organization. We continue to rely on IMAGINE when large challenging projects emerge and have every confidence in their ability to deliver. I recommend they be given serious consideration for your project. I have been working with IMAGINE Maintenance for quite a few years now and they have never disappointed. The services they provide such as window cleaning and power washing are always very thorough and professional. I would highly recommend them for your regular maintenance to keep your property looking in great condition all the time! We’ve been using IMAGINE Maintenance to do the annual top to bottom high dusting and window cleaning at our North Vancouver retail shopping center for 5 years. They have a proven track record for understanding our needs, planning ahead, staffing appropriately, and coming to the job prepared. They’ve proven time and again that they can meet our expectations on time and have provided valuable insight to the condition of our building above what we thought we already knew. Their clean uniforms and pleasant demeanour make them easy to identify and communicate with and their approach to customer service has made it very easy to sort out any discrepancies with minimal fuss. I have no reservations about recommending IMAGINE Maintenance to manage any property cleaning project. Our commercial building is comprised of mixed use tenancies which consist mainly of high-end retail. Thus, the appearance of this area is extremely important. We recently contracted IMAGINE Maintenance to clean the awnings at the retail level and found their work to be coordinated efficiently and completed in a timely manner which reduced any inconvenience to our Tenants. Their cleaning methods made the awnings appear almost brand new. We would definitely recommend this company. I had the IMAGINE team clean my fabric awnings on my home. They returned my email very promptly and set up an appt to give me an estimate for the cost of the work. Initial contact to arrival was within a few days. After that, they provided me with an estimate that I felt was very reasonable and told them to proceed with the work. Again from the time I gave the go ahead to the service appointment, it was all within a week. Very efficient. Two men arrived and carried out the work within 1.5 hours. They were pleasant, knowledgeable and professional. I will have them return when my awnings will be in need of service again. I would recommend this company as my experience with them was 100%. I am sure you will not be disappointed. IMAGINE Maintenance has been maintaining the windows at our flagship location since our grand opening in 2010. Not only was it important to us that our chosen vendor be competitively priced, reliable, insured and with good references, but also to provide a plan for safe work around our inventory. IMAGINE has delivered on every promise and will continue to be our trusted window cleaning vendor. Our commercial building is comprised of mixed use tenancies which consist of mainly high-end retail. Thus, appearance is extremely important. We recently contracted IMAGINE Maintenance to clean the awnings at the retail level and found their work to be coordinated efficiently and completed in a timely manner which reduced any inconvenience for our tenants. Their cleaning methods made the awnings appear almost brand new. We would definitely recommend this company. We recently had the IMAGINE team come to clean the retractable awning on our deck. They did a fantastic job – all of the dirt and algae is gone, and our awning looks virtually new even though it is actually 10 years old. We were delighted with the service that we received and highly recommend IMAGINE Maintenance. The level of service and quality of work I have received from IMAGINE Maintenance is excellent. They are easy to communicate with, reliable and flexible with superior attention to detail. After reviewing several contractors’ proposals we hired IMAGINE Maintenance to perform the exterior window cleaning services at our newest facility on Hastings St. Due to a lack of anchors on the roof, preventing rope-style window cleaning, the previous company was only able to clean the first four floors of our six-floor building. They presented us with a proposal that utilized aerial lifts and ensured that every window would be properly cleaned. Also, their proposal included relevant insurance and WCB documentation, combined with a price that met our budget. I was confident we made the right choice. The work was scheduled for a weekend when we are less busy. The crew did a great job and they even managed to clean the difficult to access windows in the alley. I would not hesitate to recommend IMAGINE Maintenance, we have already booked them for next year! IMAGINE provided a comprehensive and thorough cleaning solution for our large commercial building. Their annual service keeps our building looking great. We have used IMAGINE Maintenance Ltd. at both our Commercial and Residential buildings, as well as our office building for windows and gutter cleaning, and we are completely satisfied with their level and speed of service. They do an excellent job and offer competitive rates. We are happy to recommend IMAGINE Maintenance Ltd.
Interior/exterior window washing, gutter cleaning and power washing services for your home. All rolled into one money-saving bundle. Your home will thank you. 125A – 1030 Denman St.